The myth of the “holylandscape” has been shaped over time by historical truth and ever-changing interpretations. Jerusalem is composed of multiple layers: layers of history, faiths and beliefs, of rulers and subjects and of social complexity. All have left their imprint on the landscape. It is a landscape that has been scarred by centuries of power struggles, and inscribed by the testimony of its inhabitants who discovered in it the roots and wellsprings of their faith. Being the sixth generation of my family in Israel, and the fourth living in Jerusalem, has shaped my perceptions of the city. On the one hand, I grew up with the historical stories and myths of the land and on the other; I am enthralled by its charm, mystique and the beauty of the landscape. My creative process and selection of photographic sites was inspired by several sources: Pursuing the myth of Masada in Israeli culture, and its deconstruction over the years; by childhood trips to Jerusalem’s Old City and the Holy Sepulchre; and the search for my grandmother’s forebears; and my mother’s stories of finding the shattered tombstones of her grandfather and great-grandmother in the ancient Jewish cemetery on the Mount of Olives in 1967, soon after the Six-Day War. The photographs are testimonies to a landscape and the events that played out in it, and to the evidence of the past etched in stone over time. 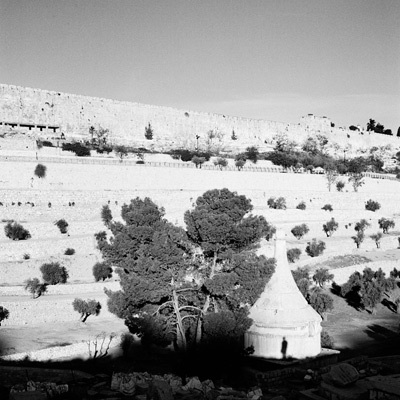 The pictures expose the layers of history and faith enshrined in them through my observation of the landscape and almost-archaeological research through the lens of my camera – looking for the human foot- and fingerprints. And always they were infused by the quest for holiness, and for those sites that raised my own sense of sanctity of place. The sanctification of the land is shaped by the way we look at and relate to it. This selection of landscapes is a product of my familiarity with the myth and significance that has enshrouded them over time. Add to that my own personal feelings of holiness that take shape as part of the photographic process. For years I have assembled photographs, places, sentiments, and a strong, direct connection to the land. This project marks only the beginning of a process of cataloguing, searching, sorting and organizing my own visual archive that in turn creates my personal-public holylandscape.